From the time Don first saw someone roasting coffee outside in an open market, took a pound home and proceeded to burn it, filling the kitchen with smoke, he has been excited about coffee roasting. Over the course of many years, which took Don and his wife Shannon to various parts of Mexico, Pittsburgh, and eventually Boone, NC, they developed Bald Guy Brew. When arsonists burnt down the business in 2016, their focus turned to training and using coffee as a platform for making a difference in the world. Coffee roasting is not just about the coffee: it's about the people who enjoy it together, the people who grow it, and the places where they live. Don's story and ways of thinking about coffee open up conversation for us to think about the ways we consume, the ways we do business, and how our lives can be intentionally lived in ways that bless the unreached and the poor. He shows some of the connections between land, people, and the global supply chains that connect us all. As you listen be thinking about ways you can live intentionally to bless the people and the lands of the world. To act justly and to love mercy and to walk humbly with your God. Paul Dzubinski and Steven Spicer host this edition of the Creation Care Missions Podcast. 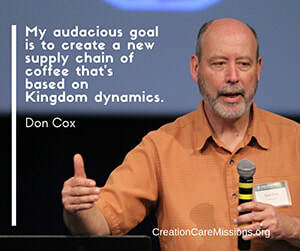 Below is the full text of talk that Don Cox gave at the Creation Care at the Frontiers of Mission conference. Dr Soderling is an MD with an MBA in International Development. After serving 11 years in Central America he returned to the US to lead the Center for Health in Mission, which seeks to see people from all nations living lives of health and wholeness. He and his wife, Chris, live and serve with Frontier Ventures (formerly the US Center for World Mission) and William Carey International University in Pasadena, CA. Their daughter, Leah, attends Judson Int School on the WCIU campus. Mike is also co-catalyst for the Lausanne Health in Mission Issue Network. The Centre for Health in Mission manages the Christian Journal for Global Health (for which Mike is Associate Editor for Missions) and stewards the Best Practices in Global Health initiative. Paul Dzubinski and Steven Spicer host this edition of the Creation Care Missions Podcast. Mike Spoke at the Creation Care at the Frontiers of Mission conference and we had the privilege to interview him. Our podcast this time features a talk from Peter Harris. He says he was born with a great love for nature, and a fascination with birds in particular. Following this ingrained concern for the environment, he co-founded A Rocha in 1983 when he and his wife Miranda moved with their family to establish a field study center and bird observatory in Portugal. 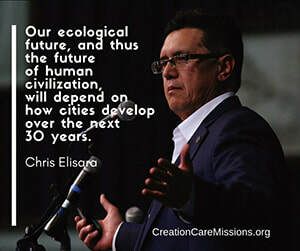 In 1995 the work was given over to national leadership and they moved to France where together with national colleagues they oversaw the establishment of two other centers, while traveling to resource the growing global movement of Christians active in nature conservation. A Rocha field projects are now operational in twenty countries worldwide, each looking for creative and collaborative ways to engage in nature conservation out of love for God and His good creation. 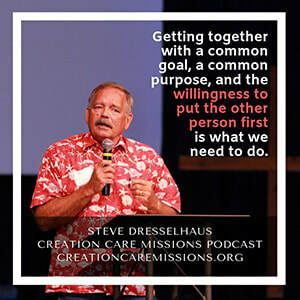 Paul Dzubinski and Steven Spicer host this edition of the Creation Care Missions Podcast. Below is the full text of talk that Peter Harris gave at the Creation Care at the Frontiers of Mission conference. 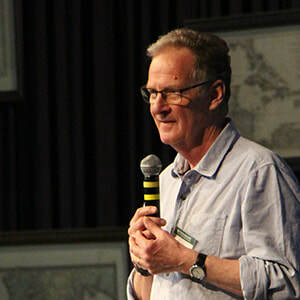 Lowell Bliss is the director of Eden Vigil, an environmental missions organization which seeks to combine church planting with creation care particularly among least-reached people groups. He and his wife Robynn, a proud Canadian, were church-planting missionaries with Christar in India and Pakistan for fourteen years. The Book Lowell mentions in his talk, People, Trees, and Poverty, can be found at WilliamCarey.com. He also is the author of Environmental Missions, Planting Churches and Trees can also be found there. As Lowell shares in the talk we are about to listen to, it was in that context, alongside the polluted Ganges River, that he developed the conviction that he must be just as much an environmentalist as he is an evangelist. For him, sharing good news with people about Jesus Christ has to include good news for their bodies and the environment they live in. As you listen to Lowell's story and his journey with God to reach the place he is now, trying to be fully committed to creation care AND frontier missions, reflect on how you're feeling. How would you respond in the circumstances he describes? Does his story give you a different perspective on caring for creation as an integral part of mission work to reach the unreached with the gospel of Jesus Christ? We want to give a little warning that his stories do get a little graphic. It is not inappropriate, but death, illness, and idols can be "PG13." 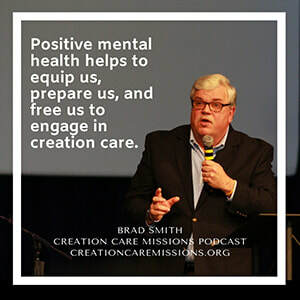 Steven Spicer and Paul Dzubinski host this edition of the Creation Care Missions Podcast. Below is the full text of talk that Lowell Bliss gave at the Creation Care at the Frontiers of Mission conference. Dr. Katharine Hayhoe is an atmospheric scientist and professor of political science at Texas Tech University, where she is director of the Climate Science Center. She is the CEO of the consulting firm ATMOS Research and Consulting, helping organizations plan for ways that climate change might impact their industries. She was named in Time magazine's 2014 100 most influential people in the world list. Through various avenues, such as her PBS show, "Global Weirding", she helps people see how the changing climate affects them and what they can actually do about it. And as a Christian, she deeply cares about the ways that climate change impact the world, the poor, the unreached, and the ways that we try to share good news in a world where the environment itself is crying out for salvation. 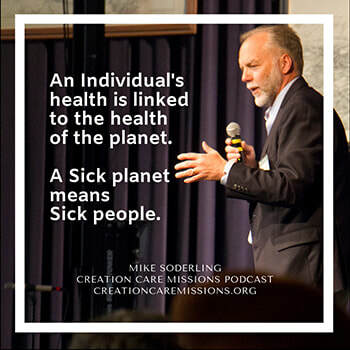 Steven Spicer and Paul Dzubinski host this edition of the Creation Care Missions Podcast. Below is the full text of talk that Dr. Katharine Hayhoe gave at the Creation Care at the Frontiers of Mission conference.